Besides motherhood, this story seems (to me) to be about doorways and the insouciance of children. There’s something about it that keeps me making these very simple compositions with only one or two images. I keep trying to make it more complex and layered, but when I do it all looks like a muddle to me and again I’m reduced to the child and the universe. Doorways to me are about choice. Do we pass through them or pass them by? Do we slam them shut or fling them open? Where do they lead? Krishna’s mouth offers infinite possibility. In fairy tales doorways generally lead one into a different reality, another kingdom, an alternative universe. Portals challenge us to change – our minds, our attitudes, our perceptions and assumptions. Change is at the heart of all fairy tales. And change is the core of the life force. Someone once told me,”Change or die!” I took her advice, and the new growth deriving from the changes I made continues to thrive and grow to this day. 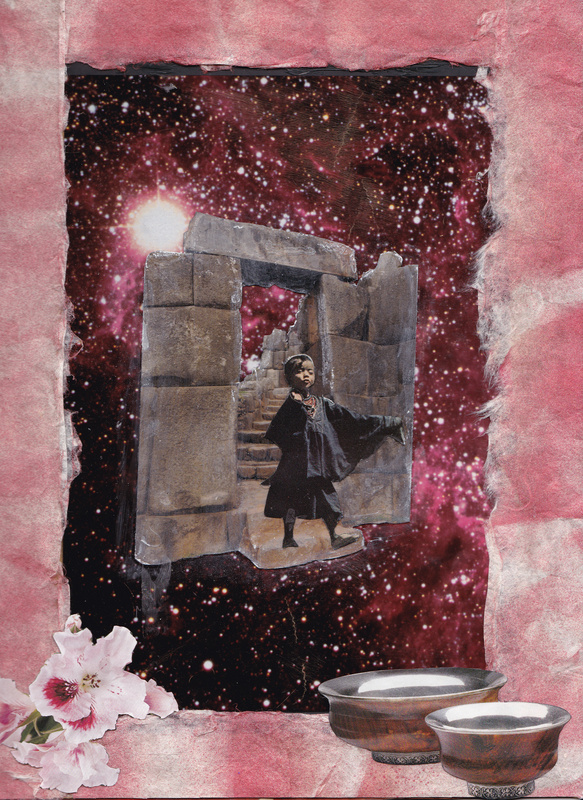 I think my collage says- “Don’t be afraid. Look at me. I’m a child, yet I step out without fear. I think the name of this piece is, And a Child Shall Lead Them. I read and re-read the story. I asked myself, “What is this story really about?” My immediate answer … I don’t know. Perhaps, it will come to me as I work on my Collage. As I looked through my images, I have boxes and boxes of cut images that I’ve collected over the 15 years that I have been doing collage art, I realize there are no images of Krishna as a child. In fact, there are only a few Hindu images period. Hindu Mythology is a subject with which I am only casually acquainted. I know a little bit about a few of the Hindu deities. I know Ganesha, the elephant headed god that removes obstacles, Hanuman, the Monkey headed God that helped recover a stolen Goddess, Kali, the Goddess who slays the demons, and Shiva, the lord of the dance. Otherwise, the many myths and epic stories that make up the religion of Hinduism are foreign to me. Finally, I found a picture of a child playing the flute. I decided I would make it into a Young Krishna. Therefore, my collage will start with that image. I looked up Krishna on the internet and read about Him on the Wikipedia website. I have many images of the Universe so I will include a few. I discover Krishna is a simple herdsman using his flute to bring the animals together. When I finish the collage and complete the Wikipedia article, I feel like I know a little more about Krishna. The Universe is Krishna, and Krishna maintains the Universe. Each of us are the Universe, we are it and we are Krishna. The divine spark is in each of us. What about the Purple Fruit. Krishna gobbles the purple fruit. I decided the purple fruits are plums. However, after I re-read the story again, I change my mind and decide the fruits are cherries. I grew up in San Leandro, CA, which at the time had hundreds, perhaps thousands of Cherry trees. There were cherry orchards and cherry trees lined the streets. In the spring, the entire town glowed with Cherry blossoms. We could hardly wait for the cherries. From time to time we would climb up in the trees and test a cherry or two to see if they were ripe yet. Finally, the cherries would turn a deep purple red. My brother and I would climb up into the trees and pick cherries popping them into our mouths as fast as we could pick them. I know from experience that there is no way you can eat all the cherries off a cherry tree. In our Tale of the Purple Fruit, the older boys are upset because Krishna is gobbling up all the fruit. They are afraid that he will eat all the fruit and they will get none. He is not doing what they told him to do. Krishna knows that there is plenty of fruit and so he doesn’t worry about what he is doing. Besides, he is still very young and is driven by the taste of the Cherries. They are ripe, juicy and delicious. At some point He will be full. Krishna, just like my brother and me who had been told Do NOT eat the fruit, we did not follow instructions. We just thought … ripe Cherries ready for the picking … gobble, gobble …Yum!